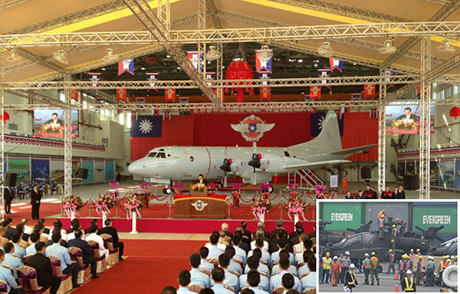 Taiwan celebrated the receipt of its first P-3C Orion at a ceremony on October 31. Three days later, the first six AH-64E Apaches arrived by sea (inset). Taiwanese President Ma Ying-jeou ceremonially welcomed the first Lockheed Martin P-3C Orion maritime patrol aircraft at Pingtung airbase on October 31. Three days later, the island’s first six Boeing AH-64E Apache attack helicopters arrived from the U.S. by sea. Neither event was publicized by the U.S. government or the contractors, no doubt because of concern that mainland China would react adversely. The long quest to replace Taiwan’s obsolete S-2T Tracker ASW aircraft began in 2001 when the U.S. indicated that P-3s could be supplied. It was soon deemed too expensive to reopen the production line, but it was not until September 2007 that a possible sale of 12 former U.S. Navy P-3Cs was notified to Congress. The cost quoted was a remarkable figure close to $2 billion, to be shared by prime contractor Lockheed Martin with Raytheon, Rockwell Collins, L-3 Wescam and EDO (Condor Systems) of Canada. That sum had fallen to $665 million by the time Lockheed Martin received a contract in March 2009. The aircraft were then trucked from storage at Davis-Monthan AFB to Lockheed Martin’s facility in Greenville, S.C., for refurbishment. But more, smaller contracts have subsequently been placed with U.S. industry to complete the package, including mission systems and engine overhaul. The aircraft can carry Harpoon Block 2 anti-ship missiles. President Ma said that after upgrading key components, the aircraft “are as good as those currently in service in the U.S.” Lockheed Martin is believed to have replaced the fatigue-affected outer wings, center wing lower sections and horizontal stabilizers, as it has done for other P-3Cs under the mid-life upgrade (MLU) program. This provides an additional 15,000 flying hours for the airframes. Ma said that three more P-3Cs will arrive by year-end, five more next year, and the final three in 2015. The Republic of China Air Force (ROCAF) has taken over the ASW and maritime patrol mission from the naval air arm that has been operating the S-2Ts. The six AH-64Es are the first of 30 that the U.S. agreed to supply in 2008 in a $2 billion package. The remainder will be delivered next year. Upon arrival at the port of Kaohsiung they were quickly reassembled. Three days later, one was displayed at the Army’s Tainan base by two of the six Taiwanese aircrew who have already been trained in the U.S.